Love this article about students tweeting to authors about the books they love! Children’s authors can be found on Twitter, providing students with a chance to share their love of a favorite book, pose a question, or give an opinion in 140 characters or less. They won’t be guaranteed a response, but students can practice a range of skills as they write concise tweets around a particular topic. PBS has a terrific PDF here about the validity of using picture books in the upper elementary classroom. 3rd, 4th, and 5th graders sometimes have a tough time connecting what they do as writers to “real world” writing. While their writing projects may span a handful of pages, they are reading full length novels–thus the disconnect. Picture books are a similar length to what students are writing. They contain that all-important beginning, middle and end, and they are well edited for conventions. Isn’t that what we are asking our students to do everyday? In the publishing industry, picture books are sometimes referred to as “lap books.” In other words, they are meant to be read to a child, not by a child. Because of this, the language used in them can be at a much higher reading level than the child’s. While these books are short, they are not necessarily “easy reads,” so teachers needn’t worry that their students are reading too far “below” them. And even if students were reading “below” them, these kids are learning about story structure, conventions, and that short pieces really are real-world writing–it validates the students’ own work. Sidebars, which I personally love, have become increasingly common in publishing. Often seen as a small box at the side of the page, these snippets of information are there for readers when they are ready for them. The reader can choose to interrupt the story to gain further knowledge, or s/he can wait until the story is done and then go back to read them. Have you tried sidebars with your writers? This could be a great way to have students work on narrative writing while incorporating nonfiction writing in it as well. 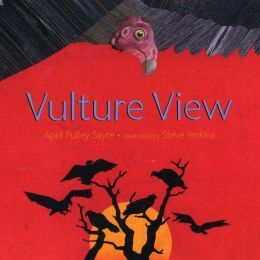 Check out April Pulley Sayre’s book, Here Come the Humpbacks. It tells the story of humpback whales as they journey through the sea, and sidebars, cleverly formatted in the Jamie Hogan’s gorgeous illustrations rather than in boxes, give interesting facts about these great creatures. I can see a bulletin board now–pages of narrative nonfiction, beautifully illustrated by the students with sidebars incorporated into the illustration. What fun! For even more fun, have the kids cover the sidebars with an illustration piece that flips over to reveal the information. Perhaps a piece of construction paper that depicts coral flips up and beneath it is an interesting fact about coral. Picture books really are a valuable aid to the writers in upper elementary school. And if you implement any of these ideas in your classroom, I’d love to hear about it! Twitter Contest for a free full-day author visit in an Ohio school next year!